Sean Gregory Earns His Second Lion of the Round Honour! 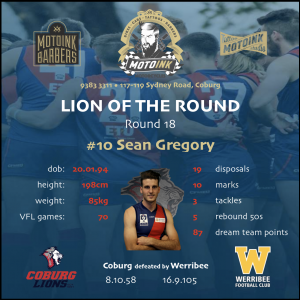 Sean Gregory has been named Round 18’s Motoink Motorcycles Lion of the Round after a standout performance in defence. Gregory had missed the last couple of weeks due to an Achilles injury but was back to his best straight away against Werribee. He had 19 disposals and took ten marks while playing an important role in defence for Coburg. This is Gregory’s second LOTR honour this season as he continually proves to be a important player in defence and is now one of the most experienced in the team having played over 60 VFL games. His role on Saturday was playing on the second tall forward. “I felt I restricted my opponents impact and was able to help out in the air and in attack,” Gregory said. He has seen a lot of improvement in the young backline group as the season has progressed. Unsurprisingly, Coburg played much better in the second and fourth quarters when it had the wind at its back but the way they moved the ball also changed in these quarters. The Lions have just two games left this season and Gregory thinks it is important that the team continues to improve over the last couple of games. “The last two weeks we want at least one more victory and to finish the year off positively,” he said. You can see Coburg in action this weekend when they take on the Northern Blues at Preston City Oval on Saturday afternoon.